“How long until the student begins making music?” This question haunts me since the days of critiquing our teaching from recordings during undergrad and grad school. Too often, it’s easy to begin with some chatter about the week and while this is great, it’s so important to help students love creating music! I have to keep reminding myself of this and find it easier if I prepare an activity to start lessons with each week so I have a plan (especially for those few students who don’t always show up prepared…) Improv activities are my favorite since there’s no pressure to play any “correct” notes and students jump right into creating something wonderful. 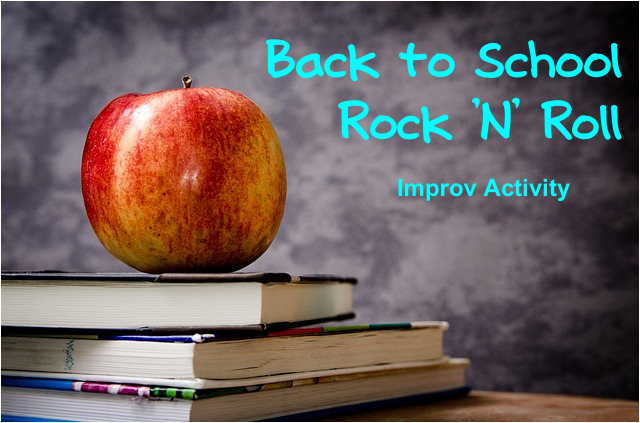 So today I wantto share a simple activity we will be using here for our first week of lessons – “Back to School Rock ‘N’ Roll Improv”. The attachment features 2 pages – the first has two hand positions (C & E Major) for students to fill in quickly and find at the piano. The second page has the improv duet part or back up for the teacher to play. If you have a younger student, feel free to just use the C position. Otherwise, they have 8 beats to change positions and be ready! *Side note, I printed my copy and stuck the sheets in page protectors (or these reusable dry erase pockets) so students can write the hand position in each time.